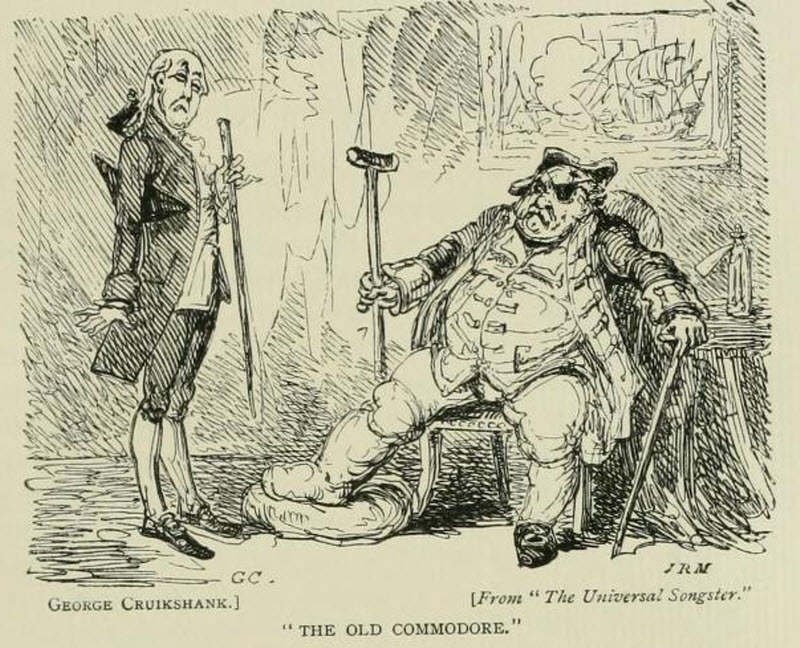 During the first part of his career, George Cruikshank devoted himself almost entirely to caricatures. His subjects were the leading political and social figures of the day, and he became in this way a sort of graphic journalist - using caricature and satire to convey truth. 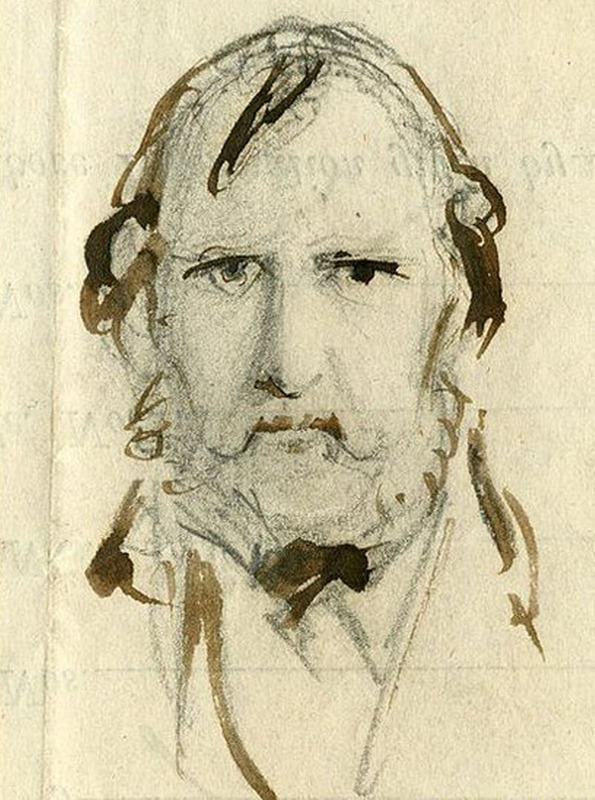 His output was prodigious - thousands of drawings over the course of his career. A few representative pieces are reproduced below to give an idea of his humour and satiric wit. 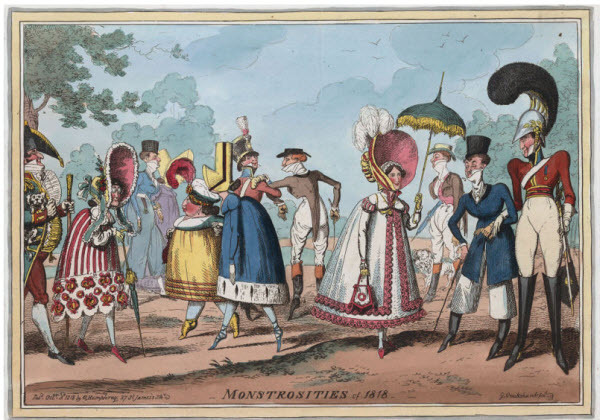 In the two caricatures that follow, entitled the Monstrosities of Fashion, Cruikshank lampoons the fashions of the day. I wonder what he would think of today's fashion shows. In this caricature, the Prince Regent is shown as a debauched drunken womanizer. 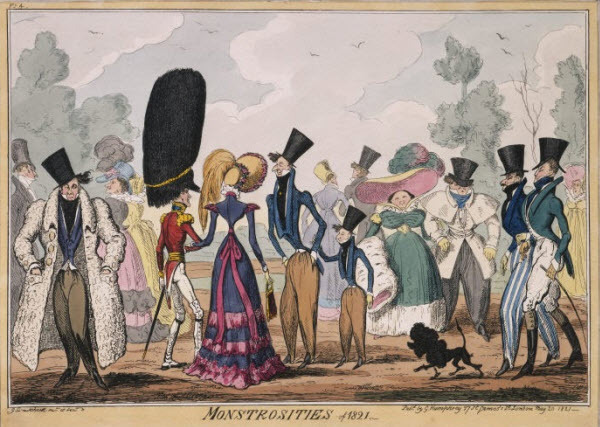 Cruikshank also makes a play on words between ReGent and NoGent, highlighting the fact that the Prince Regent is no gentleman. 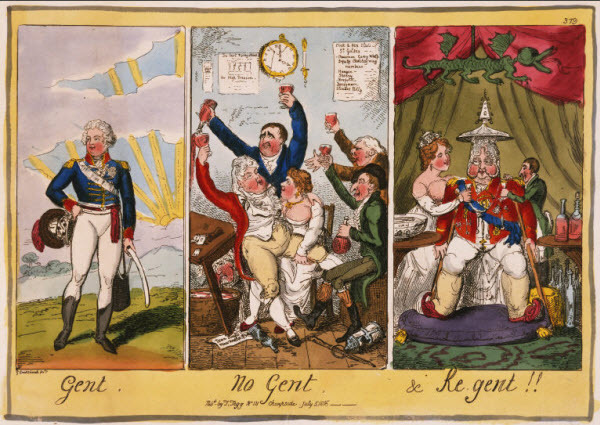 The Prince Regent: Here Cruikshank makes a play on the word "Gent" pointing out sarcastically that the Prince Regent is is Gentleman. The caption reads. "Gent. No Gent & Regent!! Published by T. Tegg, No. 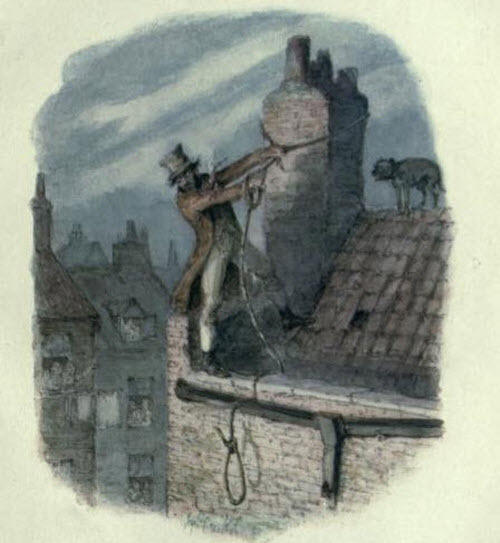 111 Cheapside, July 5, 1816." 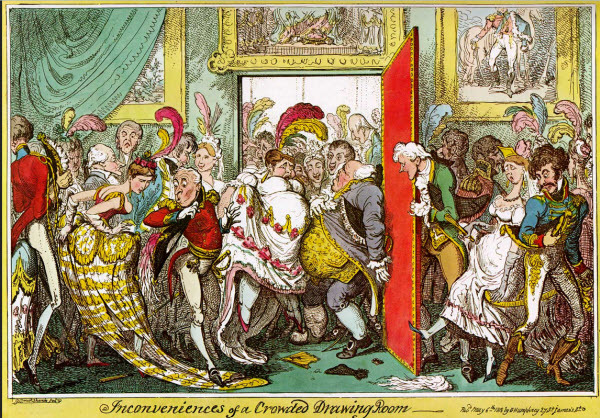 In this cartoon entitled "Inconveniences of a Crowded Drawing Room (1818)", Cruikshank caricatures the upper classes in vivid detail. The drawing depicts a crowded royal "drawing room" reception in a London palace, suggestive of the eagerness with which social climbers crowd onto the social scene and try to bustle each other out of the way. 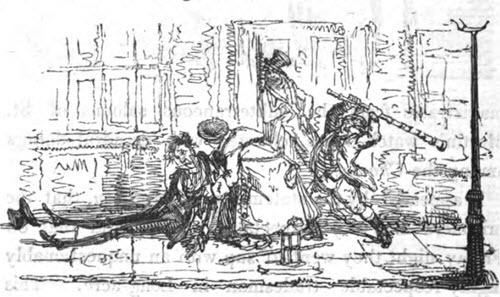 In a more serious vein, Cruikshank also used caricature as social commentary. 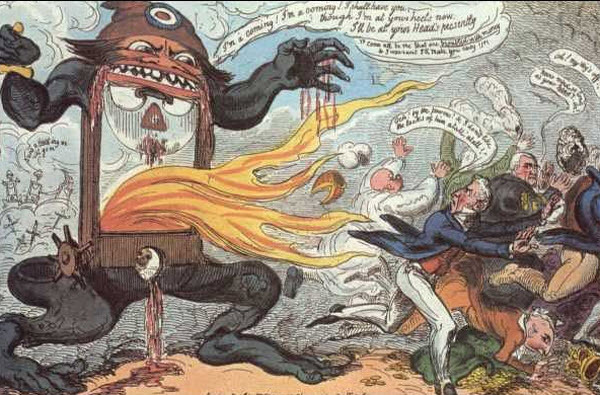 Here a caricature from 1819 entitled "Social Reform" portrays a giant guillotine pursuing its prey. The caption reads: "I'm coming! I'm coming! I shall have you! And though I'm at your heels now, I'll be at your heads presently." 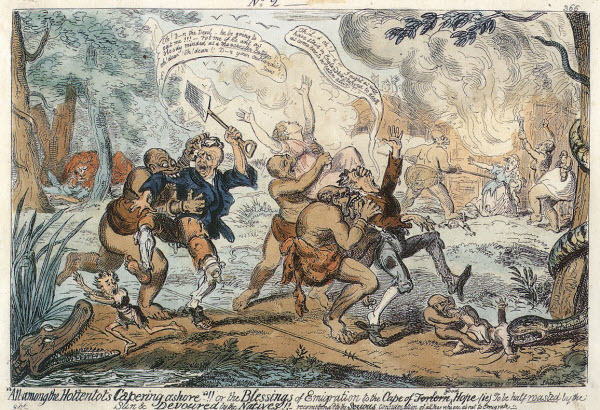 Cruikshank's criticism of social reform was understandable given the bloody end of social experiments in France during the Reign of Terror. 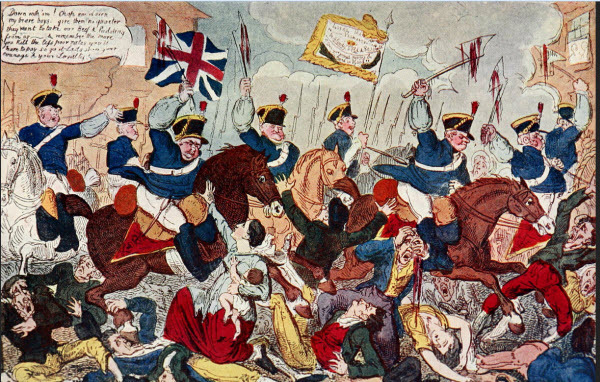 The Peterloo Massacre occurred when over 60,000 people assembled peacefully to call for social reforms and lower bread prices. The government reacted by sending a regiment of cavalry to disperse the crowed. Dozens of people were sabered and trampled to death. 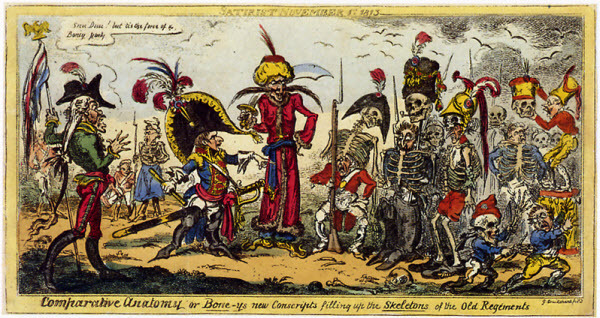 Cruikshank's caricatures are an important resource for understanding the opinions and viewpoints of the time. They offer a window onto 19th century British society as it underwent the radical transformation from a largely agrarian county to the industrial revolution and its rise to super power following the Napoleonic wars.